The places and things associated with our lives can play an important part in the floral tributes. Families in sorrow know that the loved one they have lost was not just a military veteran, a gardener or a teacher. Each of us has many interests, hobbies, and facets to our lives. When selecting your floral tributes, consider adding personal touches that tell the wonderful story of the life they have lived. Let’s say, for example, that the deceased loved to golf…when he was not playing golf, he spent time watching it. What better way to memorialize his interest and pay a tribute to his favorite pastime than a floral casket spray with a golf theme? The beautiful flowers are enhanced with his favorite golf hat and his personal putter. Perhaps the deceased was an avid fisherman. You can select a floral spray tribute accented with a fishing rod and a faux bass fish. This will invoke memories of the “best of times” he spent fishing. Personalization doesn’t limit itself to props alone. The use of symbolic numbers can evoke feelings of tribute as well. For a Mother of three children, a beautiful tribute could be a single red rose representing the husband and three small clusters of pink spray roses symbolizing the children, all set in a wonderful tribute of spring flowers. Now, you can even add a personalized message printed on the ribbon of the tribute. So if you had a special name or saying, you can have it printed right on the ribbon. Personalizing a tribute creates a feeling of the life well lived. A tribute makes the funeral service a more peaceful, comforting time… for both the sender and the recipient’s family and loved ones. 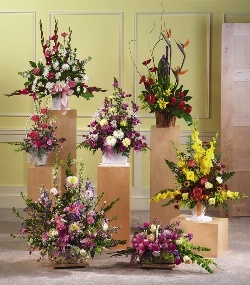 Please call or come by A Moment of Grace Florist to discuss your special personalized tribute.